One of the many benefits of working at Queromedia is learning how to work with Google AdWords. And of course getting the opportunity to become Google Certified by taking the Fundamentals exam and advanced exams. In case you didn't already know: the Fundamentals exam consists of 90 questions, for which you get 120 minutes, and you need at least 85% to pass. I fell juuuuust short the first time, which bummed me out, but on the second try I managed to pass. If you're not really comfortable studying from a screen, I recommend printing the Fundamentals PDF. 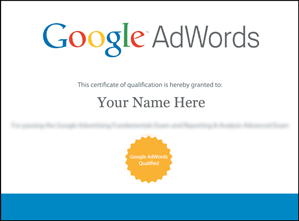 When I took the exam for the first time, I had not yet really used AdWords. Getting hands-on with AdWords will provide some invaluable experience. Especially if you're like me and have no substantial previous knowledge of online advertising whatsoever. Really hammer down on the basics. Make sure that you understand account structure, AdRank an its components, and keyword settings before moving on to specific settings. The Display Network is a bit of a different animal than the Search Network, so I recommend getting a firm grasp on the differences to prevent mix-ups. Stay calm. You have 120 minutes, which is more than sufficient. Remember that any answer you give is final, since you can not go back and alter anything after submitting.